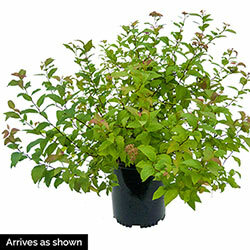 Lemon Princess Spirea - Shrubs | Buy from Michigan Bulb Co. 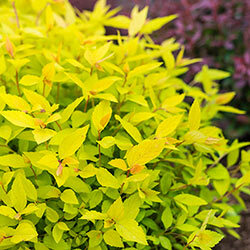 Here's a low-mounding shrub whose luminescent foliage and cheerful blooms bring considerable brightening power to a landscape, whether grown as an accent or en masse. 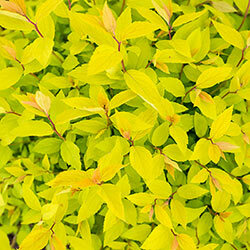 The golden-yellow new-leaf growth of Lemon Princess Spirea holds its color a long time to invigorate rock gardens, hedges and walkways. Leaves are oval shaped and sharp toothed. Tiny, pink flowers open in clusters during summer. Dense, compact habit matures at 1-1/2–2' tall. Deer tend to avoid this plant. We're shipping it right now, in a gallon pot.